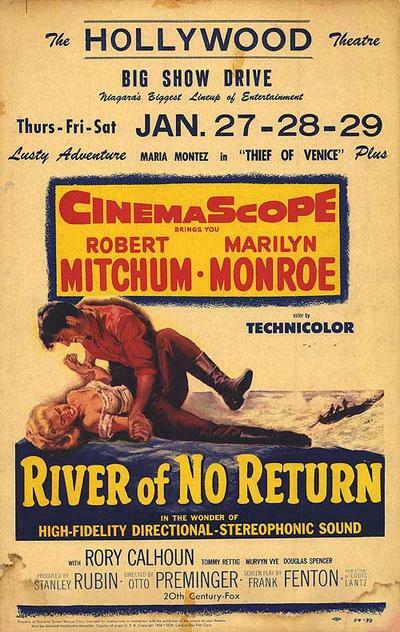 Director Otto Preminger’s only western, River of No Return is set in Canada during the 19th century Gold Rush. Farmer Matt Calder (Robert Mitchum) is released from prison after serving a sentence for shooting a man in the back to protect a friend. He arrives in a small town to retrieve his young son, Mark (Tommy Rettig), who has befriended a sultry saloon singer, Kay (Marilyn Monroe). Matt is also friendly with Kay, and thanks her profusely for looking after Mark, but distrusts her paramour, Harry Weston (Rory Calhoun)- a gambler with the morals of an alley cat. Matt and Mark return to their rural homestead, but soon glimpse Kay and Harry on a sinking raft, apparently en route to make good on a gold claim; Matt rescues the two of them, but doesn’t count on Harry doing an about face, beating him up, and stealing his horse and gun; Kay stays behind to look after Matt. Meanwhile, the Indians go on the warpath, and the defenseless trio decides to seek refuge by fleeing the farm and sailing down the river on a raft. En route, the son – thanks to Kay’s doing – is unexpectedly disillusioned about the father’s original crime. Moreover, as Matt approaches town, he begins to plot a decisive revenge against Harry.